At Cascade Plumbing, we are the experts when it comes to drain repair. We provide GTA drain services of all types, including drain cleaning, basement drains, sewer and drain replacement, clogged drain repair, blocked drain repair, and sewer drain pipe locating services. At the first sign of a clogged or blocked drain, contact Cascade Plumbing to come and assess the situation and provide the necessary plumbing services to complete the repair to your total satisfaction. With a decade of experience as GTA plumbers, we can repair or replace any damaged or unsecured drain. You can be assured that we will take the proper steps to solve your drain problems the right way and make sure that you will not have ongoing problems in the future. As a homeowner, to prevent potential trouble it is wise to regularly check your household drains to make sure that they are running smoothly and have trapped water to prevent sewer gas backup. A problem drain can lead to trouble if left in a state of disrepair. Pooling or constantly dripping water can create structural complications within your home, as well as mold and mildew which, if left long enough, can cause serious health issues. Over time, a leaky or damaged drain can cause major damage so it is important to fix any drainage problem as soon possible. A leaking or clogged drain may seem like just a small inconvenience, but if left unrepaired, it can do serious damage that can be much more expensive to fix at a later date. Our in-drain camera system can quickly identify the problem, saving time in repairs. When it comes to repairing drains, sometimes people think it's probably just a "quick fix" and they attempt to take care of it themselves... While there are some people who can fix plumbing problems without the help of a licensed plumber, the vast majority can't. Improperly repaired drains can lead to many issues down the road, and it is always best to fix something right the first time. If you have a drain problem in the GTA, please give Cascade Pluming a call for a free quote. Over time, drains will naturally become clogged just from constant use. Kitchen and bathroom drains are often the most notorious for getting backed up. Sometimes the drain issue can be solved with a simple application of drain cleaner, but occasionally you'll get a clog that just won't quit. When you notice your drain taking longer and longer to drain, and regular drain cleaning tools aren't getting the job done, trust your drain repair to a licensed plumber. We can figure out exactly where the clog is, and act accordingly to make sure that your clogged drain is fixed before becoming a larger problem than it needs to be. At Cascade Plumbing we pride ourselves on providing fast and effective plumbing services to homes and businesses in the GTA. All of our staff are professionally trained and certified, licensed plumbers. With Cascade Plumbing, you can count on us to get the job done right, at the right price. We have the experience and knowledge to take care of all your plumbing needs, including 24/7 plumbing emergencies in the GTA. If you have a rental property in the GTA, you may want to keep an emergency repair plumber on speed dial. Without worrying about the consequences, sometimes tenants can be careless and cause excess wear and tear on a rental property, including the plumbing. 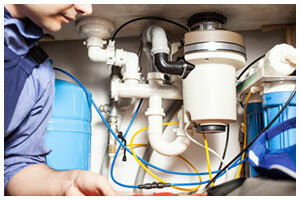 By the time you are made aware that something needs to be fixed, it may have grown into a major plumbing repair. Make sure that you never get caught in this situation by inspecting your rental property's plumbing whenever you can, and keep our number as a trusted Toronto emergency plumber, just in case.